Today’s progress report is going to be a quick one since I’m currently buried in work from both school and the Texas Education Agency (TEA). This week finally saw the scale move in the downward direction for the first time in about 3 weeks. I can’t even tell y’all how exciting it was to see the scale dip down this morning when I stepped on it. I didn’t care how much it went down so long as it was down. The 1.2 pounds I dropped this week was a hard-fought loss, but I won. I think if anything was learned this past week, it was that I need to put a little more faith in the process and spend less time beating myself up when the result is not always what I want it to be. I have also determined that perhaps dialing my calories back closer to the 800-850 range is what needs to happen, and that my breakfasts need to contain closer to 18-20 grams of protein rather than 15 grams so that I can skip a morning snack because most days I really don’t need one. I’m able to get most of my protein in through meals now that my capacity is a little greater so me having 2 snacks every day isn’t as necessary. I just need to make sure I’m eating foods that are high in protein at all meals. I need to find a way to squeeze in a gallon or more of water daily. When I get 16 cups of water in, I feel really good. It seems like 14-15 just isn’t enough. Perhaps I should start drinking 2 cups of water before I have a chance to eat breakfast. That might be a good solution. I am noticing that my arms and legs are getting more veiny, and that they are getting smaller. Also, I was able to fit into a 1x blouse at the mall yesterday, which was really exciting! Tomorrow, the plan is to have sirloin steak strips with a scrambled egg for breakfast (my version of steak and eggs for breakfast), a turkey breast cutlet for lunch with green beans, and sliced roast beef and leftover beans and rice for my snacks (I am carb loading for the gym tomorrow night). Dinner will be roast chicken breast with roast baby Brussels sprouts and almonds. I’m planning on doing a leg workout tomorrow at the gym–my arms are still sore from Friday night’s upper body workout, so I must have done something right. 🙂 I think I will try to sneak in a walk during my planning period tomorrow just so I keep from being stationary most of the day. I might even spend a little time on the dreadmill running when I hit the gym tomorrow night. Today’s eating was pretty good. Super Bowl Sunday was just another day in our house. No special food, no overindulging. We were invited to a party but declined because I had a ton of work to do as a part of a state teacher certification exam review committee which has to be submitted by 8 am tomorrow morning. I got in 102 grams of protein, 36 grams carbs and 27 grams of fat. Total calories eaten was 817, and I downed 120 ounces of water. I did have chili dogs, but they were turkey, and I didn’t eat them with buns. There’s no way I could have eaten them with buns anyway! Lots of leftovers from the weekend’s meals were consumed today to make room for the things I cooked for the week (sirloin steak, turkey breast cutlets and roast chicken breast). 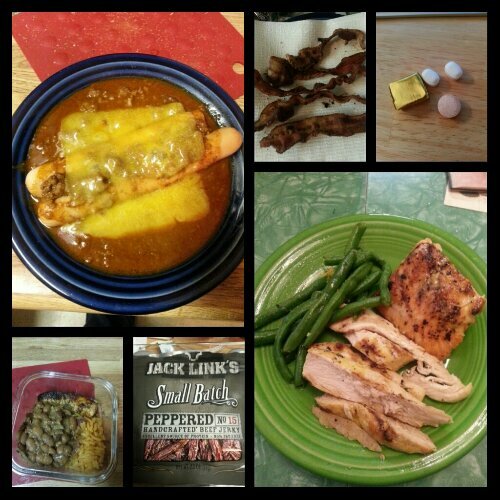 Today’s food choices, from upper right: multivitamin and calcium supplements x2, iron supplement; leftover chicken, salmon and sauteed green beans; Jack Link’s beef jerky; turkey breast cutlet, leftover rice and charra beans; Ball Park fat free turkey hot dogs with chili and cheese; slice of bacon. 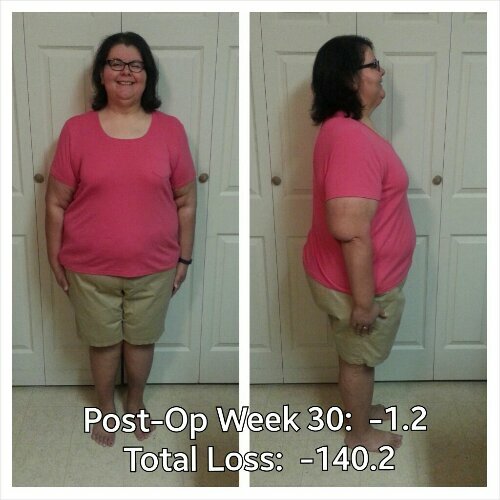 This entry was posted in choices, daily bites, eating, la guerra, little things, post-op, progreso, success, the sleeve, vsg, weight loss surgery, work happens and tagged daily bites, eating, I work out, la guerra, little celebrations, meal planning, NSVs, planning for success, post-op eating, post-op life, progreso, progress report, sleeve gastrectomy, the sleeve, things of win and awesome, VSG, vsg realness, WLS, work in progress. Bookmark the permalink. Hm. I was going to suggest upping your calories. Sometimes figuring out the formula is tough. I’m glad you are happy with your week…it makes things much easier when you can feel positive, eh?